Aquafresh Little Teeth Toothpaste - As your child gets older, their diet changes and their teeth may need extra protection against tooth decay. 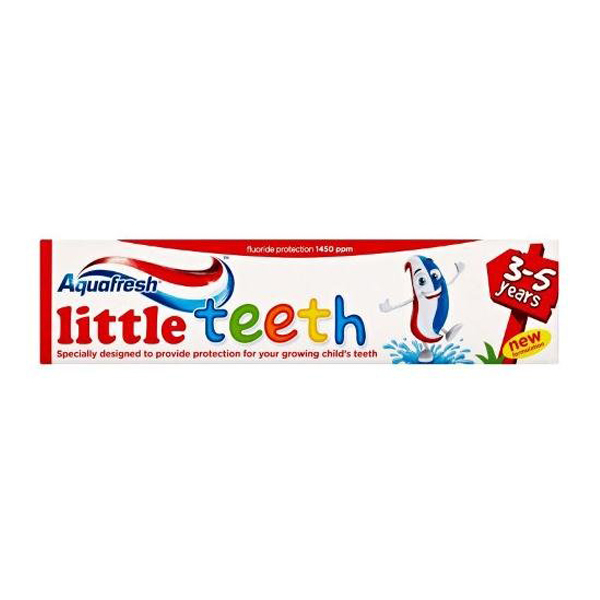 Aquafresh Little Teeth Toothpaste is made of a white and red stripe which, with regular brushing provides a protection boost for little teeth in children aged 3 to 5 years old. Little teeth toothpaste is sugar free and has a mild mint taste. Glycerin, Aqua, Hydrated Silica, Xylitol, PEG 6, Xanthan Gum, Sodium Fluoride, Sodium Methyl Cocoyl Taurate, Disodium Phosphate, Aroma, Titanium Dioxide, Sodium Saccharin, Methylparaben, Propylparaben, CI 73360.